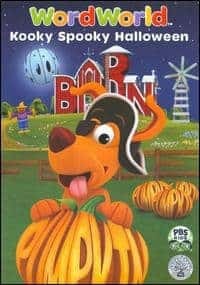 Here is a fun, affordable Halloween treat for the kids at only $6.99 for this DVD. Not only is it entertaining but it is educational too as it supports skills such as phonics, spelling, vocabulary, letter recognition and language development. With a run time of 30 minutes this is a perfect way to keep young children’s attention with these two enjoyable episodes. WordWorld™ is a popular show with my three children ages 4, 5 and 6 and they especially enjoyed this Halloween themed DVD. There is nothing that scared my easily spooked kids at all and they loved the fun, silly characters. There is even a “Monster Maker” music video. You can purchase WordWorld™ Kooky Spooky Halloween on DVD at NCircle Entertainment™. One reader will receive WordWorld™ Kooky Spooky Halloween on DVD! Well, now that my son and I have gotten off the website, I guess i can name one thing I like about it! It has most of our favorite educating and entertaining characters represented, which help him to learn with play. Sid the Science Kid is numero uno in his book, followed closely by WordWorld. We have been printing for 20 minutes! Bookmarked and duly noted, with more exploration to come. They have cute games for the kids to play! I love the games that the kids can play on the website. The girls really love playing games on the computer and especially games that involve their favorite shows. I like that they made it easier to find a show/character that you want. Much more user friendly for my son when he wants to play his favorite games. My daughters like the Pocoyo Connect the dots by colour page. I like the colorful blue and yellow backgrounds. I love love love that there is so much on their new site for kids to enjoy. Lots of games and fun. I love that it has shows my son watches. He would be inclined to play. I like the coloring worksheets, my daughter will love this! I like the coloring pages. I like the ways the movies are organized. I follow your blog on GFC, subscribe to your email and like you on Facebook! I would absolutely love to win this! I like the cute games for kids to play! Thanks so much for the fantastic giveaway! I love all of the games and activity sheets they have. So many of my son’s favorite shows! I like the activity sheets and coloring pages they have. I love all the activities! I didn’t even know that ncircle entertainment website existed! My 4 year old will be sooo happy! The site is so easy to navigate 1 click and you are there! Even my 2 year old was getting the hang of where to look for things. I didn’t realize that ncircle had a website either… especially one with some many activities! My little guy is still pretty young, so he’s not really on the computer much, but I love that they have things we can print out and do together (like coloring pages)! Gah! Helps if I get my email address right too! Typing too fast! My SON Loves the Games!! We will have to print out some of the Coloring pages to! Thanks for the chance to win!! My son Love WORD WORLD!!! I love that you can pick the show you want to do and that they have lots of different choices for you to pick from! I love that they have games on their website! My daughter is already playing them! They have Busytown Mysteries games and recipes!! And even coloring pages! My son will love this page! I like how colorful the layout is and the games are neat. I like the activity & coloring sheets. I like that the web site is geared for children. I love that the kids can play educational games online! I like that you can watch videos online. Love the colouring pages – my kids love colouring and drawing. I like that you can watch the shows online! I loved that you can watch the shows online! How nice! I like the bright colours, and that you can see the cat & the hat right on the front page! Thats how to keep my kid interested!